Americans have a deep history and a complex relationship with guns. A point of pride for some and a source of fear for others, guns continue to ignite sharp debates in our society. While gun owners and non-owners have significant differences in views about gun policy, they agree in some areas. For example, large majorities of both groups favor restricting access to guns for individuals with mental illnesses and those who are on federal no-fly or watch lists. Gun owners themselves have diverse views on gun policy, driven in large part by party identification. Here are some key takeaways from the report, which is based on a new nationally representative survey of 3,930 U.S. adults (including 1,269 gun owners) conducted using the Center’s American Trends Panel. 1Three-in-ten American adults say they own a gun. Gun ownership cuts across demographic groups but is more concentrated among some. White adults are more likely than blacks or Hispanics to own guns, and white men are particularly likely to be gun owners: 48% of white men say they currently own a gun, compared with 24% each of white women and nonwhite men and 16% of nonwhite women. Americans with less education also are more likely to be gun owners, a gap that is widest among whites. There is a vast urban-rural divide in gun ownership rates. Among adults who live in rural areas, 46% say they own a gun, versus 28% of adults who live in the suburbs and just 19% in urban areas. In addition, gun ownership is strongly linked to party affiliation: While 44% of Republicans and independents who lean to the Republican Party say they own a gun, only 20% of Democrats and Democratic leaners say the same. 2 Protection tops the list of reasons for owning a gun. 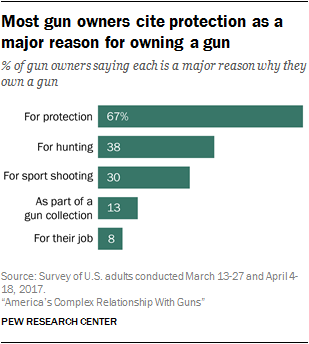 While many gun owners say they have more than one reason for owning a firearm, 67% cite protection as a major reason. About four-in-ten gun owners (38%) say hunting is a major reason, and 30% cite sport shooting. Smaller shares cite a gun collection or their job as major reasons. Majorities of gun owners who live in cities, suburbs and rural areas say protection is a major reason they own firearms. But owners who live in rural areas are significantly more likely to cite hunting as a major reason for owning a gun. While men and women gun owners are about equally likely to say protection is a major reason (65% and 71%, respectively), men are more likely than women to say hunting and sport shooting are central to why they own a gun. Two-thirds (66%) of gun owners say they own more than one firearm; roughly three-in-ten (29%) say they personally have five or more guns. Among those who own just one gun, handguns are by far the most popular: 62% say they own a handgun, compared with 22% who say they own a rifle and 16% who say they own a shotgun. 3Many gun owners say they usually have a gun close at hand. About four-in-ten gun owners (38%) say there is a gun that is both loaded and easily accessible to them all of the time when they are at home. And about a quarter of handgun owners (26%) say they carry a gun outside of their home all or most of the time. Among handgun owners who live in a community they think is unsafe, the share who carry all or most of the time rises to 41%. When it comes to safety measures such as keeping guns locked away and unloaded, storing guns and ammunition separately, taking gun safety courses, and keeping shooting skills up to date, non-gun owners are consistently more likely than gun owners to say each is essential. And regardless of whether they own a gun or not, people are more likely to say that keeping guns locked away and unloaded and storing guns and ammunition separately are essential steps to take if the gun owner has children in the home. 4 For most gun owners, owning a firearm is tied to their sense of personal freedom. While gun owners and non-owners tend to agree on most top-tier constitutional rights, one key difference is the extent to which owners associate the right to own guns with their own personal sense of freedom. Roughly three-quarters of gun owners (74%) say this right is essential, compared with 35% of non-gun owners. Partisanship is strongly correlated with views about the importance of gun ownership as a guaranteed right. Among gun owners, Republicans and Republican-leaning independents are about twice as likely as Democrats and Democratic leaners to say owning a gun is essential to their freedom (91% vs. 43%). 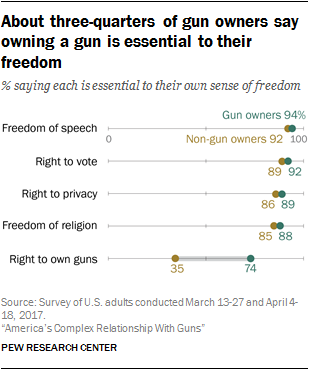 In fact, Republican non-owners are more likely than Democratic owners to view the right to own guns as essential to their freedom (61% vs. 43%). 5 Gun owners and non-owners disagree on many gun policy proposals, and among gun owners, Republicans and Democrats don’t see eye to eye. Owners and non-owners are sharply divided when it comes to creating a federal database to track gun sales, banning assault-style weapons, and banning high-capacity magazines. However, while support for these proposals is much higher among non-gun owners, significant shares of owners are open to these proposals. There also are areas of agreement. 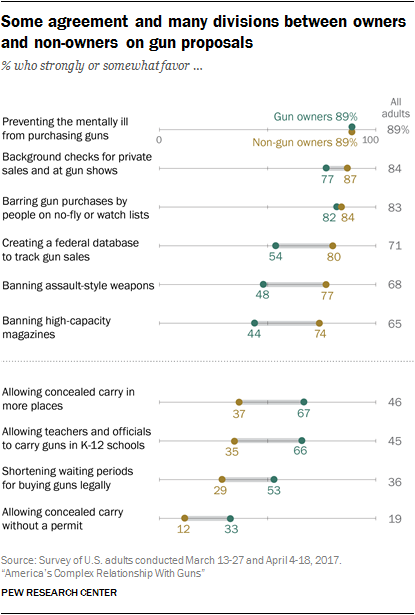 Solid majorities of both gun owners and non-owners favor limiting access to guns for people with mental illnesses and individuals who are on federal no-fly or terrorist watch lists, and strong majorities favor background checks for private sales and at gun shows. There is also a partisan divide on views of gun policy, and these differences remain even after controlling for gun ownership. For example, Republican gun owners are much more resistant than Democratic owners to banning assault-style weapons and high-capacity magazines as well as creating a database to track gun sales. And Republicans are much more open than Democrats to proposals that would expand gun rights, such as allowing people to carry concealed guns in more places and allowing teachers and officials to carry guns in K-12 schools. 6There’s a sharp partisan divide over the NRA’s influence on gun laws. About one-in-five U.S. gun owners (19%) say they belong to the National Rifle Association. Republican and Republican-leaning gun owners are twice as likely as Democratic and Democratic-leaning gun owners to say they belong to the NRA (24% vs. 11%). The public as a whole is closely divided over the NRA’s influence over U.S. gun laws: 44% of all adults say the NRA has too much influence over gun legislation, while 40% say it has the right amount of influence. Another 15% say the NRA has too little influence. Opinions about the group’s influence are driven largely by partisanship. A majority of Democratic gun owners and non-owners say the NRA has too much influence (60% of Democratic owners, 67% of non-owners), while similar shares of Republican gun owners and non-owners say it has the right amount of influence (67% of Republican owners, 62% of non-owners). 7 Gun owners and non-owners have differing views on the severity of gun violence. Overall, half of Americans say gun violence is a very big problem in the United States, but perceptions of gun violence vary considerably by gun ownership. While six-in-ten non-gun owners (59%) see gun violence as a very big problem in the country today, only a third of adults who own guns say the same. Americans see many factors as playing a role in gun violence. 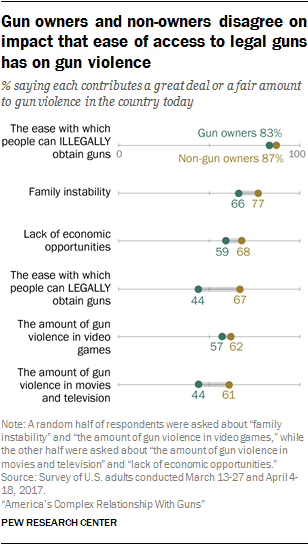 Among all adults, 86% say the ease with which people can illegally obtain guns contributes a great deal or a fair amount to gun violence; 60% point to the ease with which people can legally obtain guns. And while similarly high shares of gun owners and non-owners cite illegal access to guns as a major contributor to gun violence, opinions diverge when it comes to guns that are obtained legally. Two-thirds of non-gun owners (67%) see this as a contributing factor to gun violence, compared with fewer than half (44%) of gun owners. 8Many Americans say they know someone who has been shot. A significant share of Americans (44%) say they personally know someone who has been shot, either accidentally or intentionally. Gun owners are more likely than non-gun owners to know someone who has been shot (51% vs. 40% of non-owners). And black adults (57%) are more likely than whites (43%) or Hispanics (42%) to know someone who falls into this category. About a quarter of Americans (23%) say they or someone in their family have been threatened or intimidated by someone using a gun. Again, blacks are more likely than whites to say they have had this experience: About a third of blacks (32%) say they or someone in their family has been threatened or intimidated by someone with a gun, compared with 20% of whites. About a quarter of Hispanics (24%) say this has happened to them or to someone else in their family. Gun owners are no more likely to have experienced this than non-gun owners.